The new Q4X sensors are available with bipolar discrete (NPN and PNP) and analog (0-10 V or 4-20 mA) output options. With high-resolution capabilities, discrete models can detect objects as thin as 0.5 mm, while analog models precisely inspect part dimensions and positioning with resolution down to 0.15 mm. 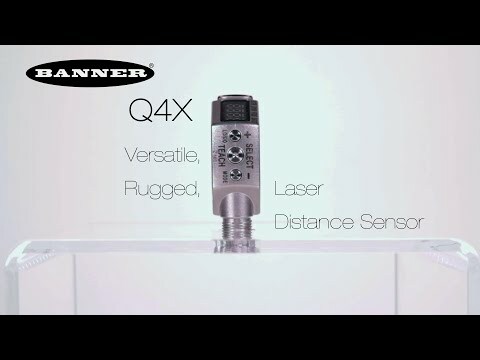 Banner’s Q4X is ideal for difficult distance-based sensing applications as it easily detects objects regardless of target surface reflectivity, including black foam on black plastic, black rubber in front of metal, multicolor packaging and targets of all colors. Also available with a dual teach mode, discrete Q4X sensors can detect clear objects or changes in signal intensity due to changing color or reflectivity. For a simplified user experience, the Q4X includes a bright readout on a highly visible, angled four-digit display that is easily viewed from multiple vantage points. The Q4X also offers intuitive user setup utilizing three tactile push-buttons conveniently located below the display.